March 16, 2016 – The first of two joint ESA-Roscosmos missions to Mars has begun a seven-month journey to the Red Planet, where it will address unsolved mysteries of the planet’s atmosphere that could indicate present-day geological – or even biological – activity. The Trace Gas Orbiter and the Schiaparelli entry, descent and landing demonstrator lifted off on a Proton-M rocket operated by Russia’s Roscosmos on Monday from Baikonur, Kazakhstan. Signals from the spacecraft, received at ESA’s control center in Darmstadt, Germany via the Malindi ground tracking station in Africa at 21:29 GMT (22:29 CET), confirmed that the launch was fully successful and the spacecraft is in good health. The orbiter’s solar wings have also unfolded and the craft is on its way to Mars. 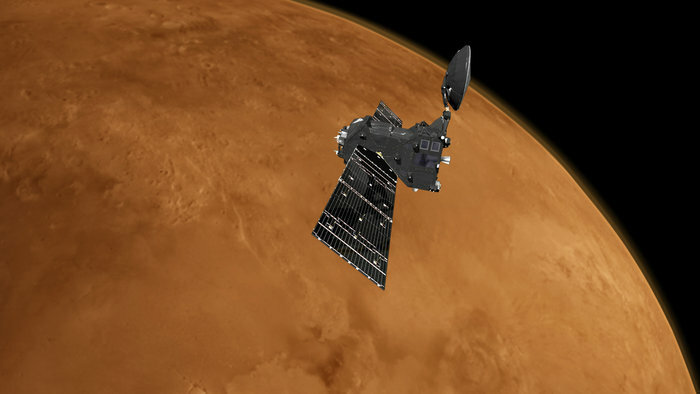 The Trace Gas Orbiter (TGO) and Schiaparelli will travel to Mars together before separating on October 16 at a distance of 900,000 km from the planet. Then, on October 19, Schiaparelli will enter the martian atmosphere, descending to the surface in just under six minutes. After a year of complex ‘aerobraking’, maneuvers during which the spacecraft will use the planet’s atmosphere to lower its orbit slowly to a circular 400 km, its scientific mission to analyse rare gases in the atmosphere will begin.